RECODE is committed to leveraging the post-secondary ecosystem as a meeting place for social entrepreneurs and impact investors. Universities and colleges have the potential to become engines of social venture and social enterprise creation, and vital innovation hubs for surrounding industries and communities. 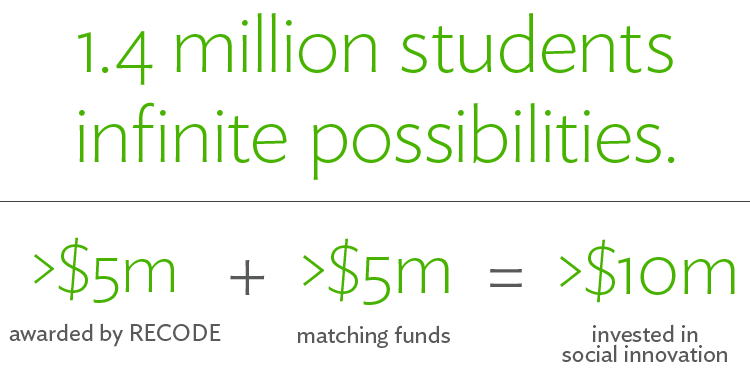 RECODE’s ultimate goal is to support students and build lasting relationships between schools, social ventures and enterprises, and impact investors that are self-sustaining. Investors play a critical role in thriving entrepreneurial ecosystems. They enable social entrepreneurs and innovators to take risks, and expand solutions that work. Globally, impact investment has the potential to grow to nearly $1 Trillion by 2020, and in Canada, investors of all stripes have expressed interest in impactful ventures. Yet the availability of capital for new social ventures and enterprises remains relatively small and fragmented, and varies widely from region to region. In partnership with the Business Development Bank of Canada (BDC), Futurpreneur Canada makes it easier for aspiring young business owners to access mentorship, secure financing, and launch their businesses. For 18 – 34 year olds, they offer collateral-free loans of up to $15,000 at better interest rates than most banks. If more money is needed, BDC partners may provide up to $30,000 extra. Learn more. For 35 – 39 year olds — apply to receive financing through the BDC (up to $45,000). Applicants can still apply through Futurpreneur Canada to access a mentor, but financing terms and conditions are from BDC. Learn more. The MaRS Centre for Impact Investing is a social finance hub and project incubator that acts as a collaboration space for all sectors – government, community, and private—to strengthen our collective ability to mobilize private capital for public good. The Centre’s knowledge hub includes a sector map, resources, funding sources, your guide to social finance, and social impact measurement. Led by the MaRS Centre for Impact Investing in close collaboration with TMX Group Inc., the SVX is a local, impact-first platform connecting social ventures, impact funds, and impact investors to catalyze new debt and equity investment capital for local ventures that have demonstrable social and/or environmental impact, including not-for-profits, co-operatives, and for-profit corporations. This platform includes venture listings, fund listings, service provider listings, and a resource centre to facilitate effective impact investments. It also allows investors to identify screened impact investment opportunities, and share due diligence and collaborate on deals, reducing the burden of due diligence. Finally, it provides ventures with increased access to capital and financial expertise. SocialFinance.ca, a program of the MaRS Centre for Impact Investing, is an online community and information hub for social finance and impact investing in Canada. This is a platform to support the community of people and organizations helping to make Canada a global leader in social finance, to promote best practices, learnings, information, and analysis and finally to engage investors, entrepreneurs, and enablers in open discussion on the potential for social finance as a lever for change. Check out their Social Finance 101 page and Social Finance Tools page. The Chantier de l’économie sociale has, over the years, created two financial tools expressly designed to serve social economy enterprises. The Réseau d’investissement social du Québec provides adapted financing for social economy enterprises in the start-up, consolidation, expansion, or restructuring phase. Its two main areas of focus are capitalization and technical assistance. It also provides pre-start-up offerings for budding entrepreneurs. The Chantier de l’économie sociale Trust provides loans with a 15-year capital repayment moratorium. This quasi-patient capital is designed to support enterprises’ operations and contribute to their real estate.